The Farm Credit Foundation for Agricultural Advancement announces the appointment of Karl Binns as their new outside director. Karl Binns has been appointment to the Farm Credit Foundation for Agricultural Advancement's board of directors. Farm Credit has been integral in helping to attract a new generation of young people to the food and agricultural industry. I look forward to being a part of inspiring the next generation of agricultural leaders throughout the region. The Farm Credit Foundation for Agricultural Advancement recently announced that Karl Binns has been appointed to their board of directors. He will assume his new role in January 2018. 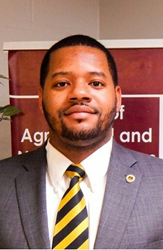 Binns is currently the lead development officer at the University of Maryland Eastern Shore’s School of Agriculture and Natural Resources, and serves as the school’s MANRRS advisor. This past year, he was awarded the Maryland State Department of Education’s Outstanding Change Agent for Postsecondary Education honor. Binns is also a member of the Baltimore City Extension advisory board, and is involved with the Maryland Council for Agriculture Education. For more information about the Farm Credit Foundation for Agricultural Advancement, please visit FCFoundationforAg.org. The Farm Credit Foundation for Agricultural Advancement is a non-profit foundation formed in 2015, created to help advance the future of agriculture. The Foundation’s scholarship program is open to all students residing in MidAtlantic Farm Credit’s five-state territory who are studying to pursue a career in agriculture and fit the eligibility requirements.